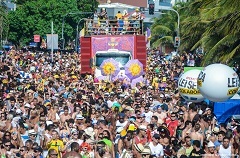 Experience the buzz of Brazil's biggest party - Rio Carnival! Samba in the streets at one of the bloco street parties, dance the night away in the Sambadrome and then relax and recharge with an icy cold caipirinha on the famous Copacabana Beach! 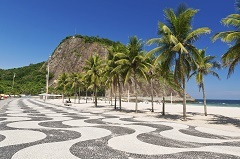 On arrival in Rio you will be met at the airport by a local guide and privately transferred to your hotel. The guide will update you about the timings for the following day's schedule and then the rest of the day is at your leisure. The excitement is palpable as the one month build up to the biggest event of the year hits its peak. Visitors and locals mingle and dance on the street under the hot summer sun. Costumes are essential. Feathers, fluoro, flower crowns and fairy wings are everywhere - with a liberal sprinkling of glitter. Music blasts from every corner. Enterprising Cariocas (Rio residents) sell passersby cold beer, water and soft drinks out of eskies on the street. It seems like almost every store turns into a makeshift bar. Feisty shopkeepers ferry huge bottle of beers out to their colourful clientele perched on wooden crates in the street. Linger a little longer and they are bound to invite you to join. This morning you will be collected by a local guide for a half day city tour to discover why Rio is known as one of the most beautiful cities in the world. Your tour will include the big icons - Cristo Redentor (Christ the Redeemer statue) and Pao de Azucar (Sugarloaf mountain). 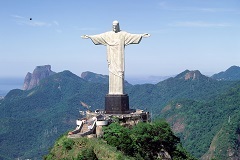 Corcovado, or the hunchback, is the mountain that Christ the Redeemer stands upon, rising 700m above the city. 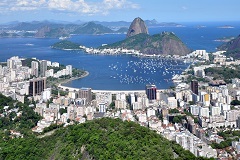 Look out from the peak and see Rio's famous white sand beaches, Guanabara Bay and Sugarloaf mountain. The dramatic landscape is breathtaking. Green wilderness tumbles down the escarpment to meet the sea. Huge granite formations rise up unexpectedly, interrupting sprawling suburbs and creating a striking urban/nature contrast. 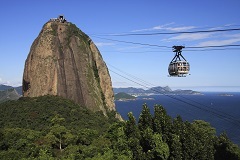 Another Rio must do is to climb to the top of Sugarloaf Mountain for yet another spectacular view. The impressive cable car system carries visitors to the top of the mountain in two stages and gives you a different perspective of the city. Gaze back across crescent-shaped Botafogo Harbour and surrounding business district, past the colourful artsy streets of Santa Teresa clinging to the hillside and up to Corcovado rising in the distance. The afternoon is once again at your leisure. Perhaps continue your explorations with a few hours wandering the art studios and cafes of Santa Teresa or visiting the famous mosaic-tiled Lapa Steps and Lapa Arches? Alternatively take the opportunity to rest up and prepare for this evening's main event - the Sambadrome. Rio Carnival's famous Samba school competition draws crowds from across the world. Samba is an icon of Brazil's cultural identity. With strong roots in Brazil's African slave trade, Samba is an amalgamation of a variety of different cultures and religions. Brazil, like many places, is afflicted by significant class and racial divisions however Samba transcends race and class. In the 1930s, newly established samba schools began parading through the streets of Rio in the week before Lent. Competition was fierce and eventually time limits and rules were put in place. In 1984 the Sambadrome, a 700m long parade arena with stadium seating for 90,000 spectators was created. 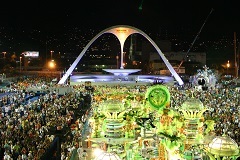 Every Carnival week, Rio's samba schools compete to be crowned the winner of the cherished event. Tonight, you will be transferred from your hotel to the Sambadrome by shuttle bus. The first school starts dancing at about 7pm and each school has one hour to parade down the full length of the stadium. Performances - months in the making - involve hundreds of elaborately costumed dancers, huge brass bands, bright, over the top floats and even confetti canons. The atmosphere is electric. It won't be long before you're dancing in the stands! The festivities continue through the night. Die hard fans can soldier on until the final school finishes, usually around 6.30 - 7am. If your enthusiasm fades earlier you can get a return shuttle to your hotel after the end of each school's performance. Today is a free day - to recover or continue the party. 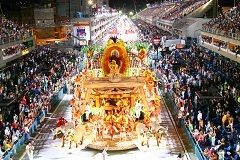 Rio Carnival is about celebrations and every day there are multiple scheduled street parties, known as Blocos. Huge crowds of people, sometimes numbering in their thousands, party their way along predetermined routes throughout the city. Large sections of the city are closed - even highways and tunnels. Open top buses and flat bed trucks carrying musicians, dancers and huge speakers keep the party going. Blocos are often themed. The Beatles and Copacabana blocos are some of the favourites. Seeking a place to relax and recharge? It's time to head to Rio's famous beaches for some sun, sand and icy caipirinhas. 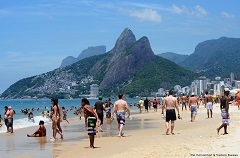 A day at Copacabana or Ipanema is an essential part of any visit to Rio. The beach is an integral part of life in Rio and gives you an insight into what makes Cariocas tick. People from all walks of life are out soaking up the sun and people watching. Bronzed Cariocas cycle and rollerblade along the beachfront and hawkers sell all manner of products from bikinis to grilled cheese on a stick. Hire a beach chair and umbrella from one of the beachfront stalls, open a tab and a bronzed Carioca will deliver beer and caipirinhas to you all day long. 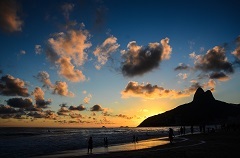 As the sun goes down over the nearby Dois irmãos (two brothers) hill the bars and restaurants get busier as Rio's nightlife kicks off. For more street parties head to the Lapa Arches or if you're after some food why not go to dinner at a traditional Brazilian charrascaria? This morning you will be transferred to the airport by a private car to catch your next flight. If you have time why not spend a few extra days exploring Rio or discovering a little bit more of what this diverse and beautiful country has to offer? Please note this is a small sample of the available hotels in Rio de Janeiro during Carnival. Speak to one of our travel designers for alternative hotel choices. Hotel rates are based on twin share in lead in rooms. Other room types and hotels are available. Rates are subject to change.